i have a number of regrets about my years at art college, not the least of which is that i really wasn't very good. like many with artistic pretensions, school years are often those of minor adulation; generally speaking, during primary years, i and one other fellow tended to win any art competitions and share top marks in the class art exams. on reaching secondary school, suddenly i was thrown in with the best from other primary schools; still good, but no longer top dog. on reaching art college, my peer group consisted entirely of students who were, on the whole, far more creative and skilled than was i.
i am firmly of the belief that in order to succeed as an art student and subsequently as an artist, you need a singular vision, a means of describing that which inspires you to put pencil, pen or brush to paper or canvas. that, to be completely honest, is where my cunning plan pretty much fell apart. but one other regret is that i spent absolutely no time whatsoever drawing or painting bicycles. despite several years ostensibly at the cutting edge of printmaking, drawing and painting, i do not recall drawing even so much as a saddle, let alone an entire bicycle. surely, i hear you say, the time is right to remedy that situation? you would think so, but take a good look around you; with folks such as jo burt, richard mitchelson, taliah lempert, shan jiang and others, other than for the simple solitary pleasure of drawing, where would i fit in? plus, in case you'd not noticed, i've all these words to write every day. far better, i feel, to praise and celebrate the works of others in these black and yellow pixels than sully the world of cycling art with my own meagre efforts. take eliza southwood, for example. 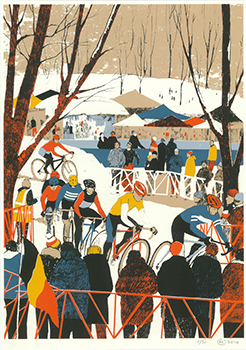 arrive at elizasouthwood.com and you'd be under no illusion that her favoured subject matter is that of the bicycle. why? "First of all I like cycling! 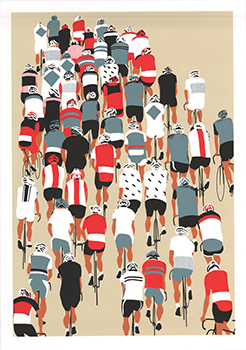 I'm not a great cyclist myself, I just commute, but I follow the Tour, the Vuelta and the Spring Classics, and have an interest in cycling generally. What happened is that I started out with a cycling themed show at 'Look Mum No Hands!' 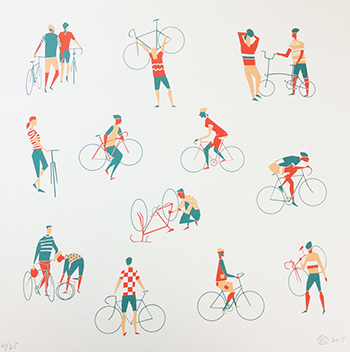 in London, but I also like designing series of things, so I drew a whole series on the 'old time greats' of cycling. "The show went really well; someone from the Victoria and Albert museum walked in and commissioned me to design a print for the V & A shop. From there I became known for cycling, and I carried on. I never get tired of drawing bikes. But I love drawing all sorts of things, like people and urban landscapes. Anything really." but far from starting life with a career plan of becoming an illustrator, ms southwood trained as an architect before the pictures took over. the art college at which yours truly trained, shared grounds with a school of architecture, a location we frequently were required to visit due to their having superior lecture theatre facilities. as know-it-all art students we would usually castigate any apparent artistic affectations demonstrated by the builders, often claiming that architects would struggle to draw curtains. however, on the basis that eliza can quite obviously draw and particularly well at that, was it this nascent ability that drew her away from set squares and rulers? "I only chose to do architecture because I was a bit worried that if I did art, I wouldn't be able to find a job after college. I grew up in an educated, but poor environment and was always conscious that I would need to support myself. I always wanted to do art originally. I painted and sketched all the way through my architecture career. It's true that a surprising percentage of architects can't draw. When I was an architect, I was always asked to draw the 'artist's' impression of whatever building we were designing at the time." reduced to two overly simplistic factors, an artistic career depends essentially on two specific factors: the ability to draw and an ability to deal successfully with colour. even in young kids it's possible to see some of them struggling with the latter when completing a colouring book. though the drawing is already taken care of, filling the empty spaces depends on their innate choice of crayons, felt tips or colour pencils and some rather obviously struggle more than others. 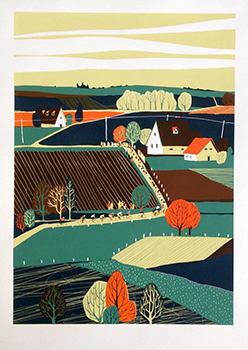 the most notable aspect of eliza southwood's visions, other than the obvious cycling connection, is her superb use of colour. is that of greater importance to her than the specifics of the subject matter? "Possibly, but everything is connected. I am obsessed with colour and I spend hours trying out colour combinations. If you show me a colour, I know exactly how to mix it. However, looking at my ink box in the studio, I see that I tend to use the same colours over and over again. One thing you won't catch me with is neon. Even if it's in fashion!" an art college education is designed to train the prospective artist in the myriad techniques available at their fingertips to allow the best means of expression. certain compositions pretty much suggest which they might prefer, if that doesn't sound too pretentious, but it's also true that an individual might find themselves favouring one over the others. does eliza have a favoured medium, chosen from print, painting or drawing, even though the first two could be arguably seen to depend on the latter? "I love them all the same I think. Maybe printmaking. I don't know; I just like producing stuff." sadly, i am not in the habit of attending any of the world's major cycle races, being wimpish enough to be satisfied with watching the majority on the tellybox, or on the interweb. however, anyone who has stood for any length of time at the roadside awaiting the arrival of the entourage, will probably never cease to marvel at the speed attained by a rushing peloton. 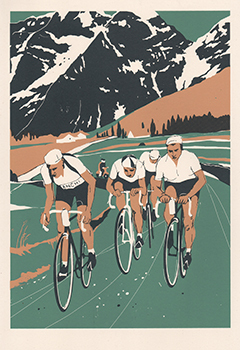 that speed, however, makes it all but impossible to sit and sketch those chaps or chapesses on the race bicycles. it would therefore most likely be naive of me to ask if eliza's illustrations are done from life, though i imagine her portraits are. does she have a preference as to how she captures her subject matter? 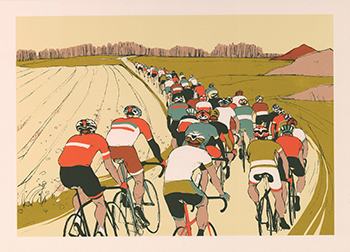 "No, my cycling illustrations are made with the help of photos, either found on the internet or taken by myself. I usually use rubbish photos that are blurred or have bits missing and then make something completely new inspired by the photo. Or quite often I just make a scene up and then check body positions etc later by looking at photos. "I do life drawing every so often to keep me on my toes with human anatomy. Portraits are from life unless they are children - then I just look at a tonne of pics of them and come up with something. They can't sit still." van gogh, despite a deserved reputation for his depictions of sunflowers was not, so far as i know, a renowned gardener. similarly, though cézanne spent many an intense hour in front of mont saint victoire, i am aware of no inherent desire to climb mountains. therefore, though eliza southwood displays an undoubted affinity for bicycles, is she a cyclist in 'real life'? "Yes but a crap one. I own two Bromptons and a vintage Eddy Merckx Corsa Extra. I injured the ligaments in my knee recently falling off my bike and apparently the best recovery exercise is cycling! But I'll have to get the turbo trainer out; I'm not allowed back on the roads yet." artistic endeavour of any persuasion is fraught with insecurity. i would still maintain that you can really only consider yourself to having arrived, when folks purchase your artwork becasue it's your signature at the foot of the canvas or print. if your work is bought simply because it matches someone's wallpaper, it might be better to hang onto the day job. one way round that is to assemble a decent portfolio of commissioned works, though that can admittedly lead to a curtailment of freedom of experession. does eliza work predominantly to commission, or does she prefer to be a more of a free spirit? "I prefer to be a free spirit, to be honest, but the commissions keep coming in and it would be churlish to turn them down. I don't have a problem finding inspiration for my commissions though - I'm in the right job." it's the relative instability of matching an artistic career while still paying the bills that can often lead to something of a stagnation of output. a bit like scotland's jolomo, finding a successful milieu that everyone seems to love often results in an endless series of remarkably similar pictures along with attendant fridge magnets, calendars, diaries and similar tat. however, few artists of my acquaint seem keen to adhere to the businessman's need for a five year plan, perhaps a step too close to normality for most. does eliza southwood have a cunning plan for the future, or does she prefer to let the world of cycling dictate the next step? "Right now I'm constantly busy, too busy to dwell on future plans, but it would be good to reflect on 'what's next?'. I'll definitely keep drawing bikes, although recently I've been asked to do a range of different things. 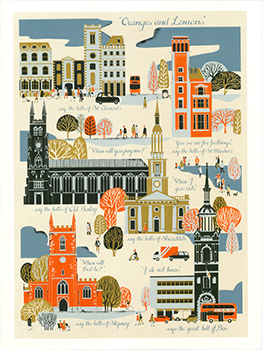 Glamorous party people, whippets and cityscapes feature in my most recent commissions. all images copyright eliza southwood. reproduced with permission.